We love Broadway, we love karaoke, and we love to have a good time. Join us for our 2nd annual Broadway-themed Karaoke night! Whether you want to do the Time Warp again, sing about Summer Nights with your squad, or dance, jive, and have the time of your life then come out to Broadway Karaoke. There will be Broadway themed drinks, giveaways for Chicago, A Bronx Tale, A Christmas Story, and plenty of opportunities for you to sing your heart out. This party will feature the debut of the Karaoke Wheel of Fun, which you can spin to increase your odds at winning Broadway tickets! 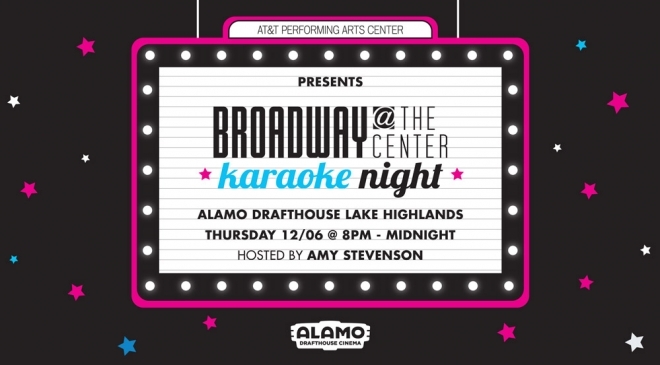 Hosted by Amy Stevenson at the Vetted Well (located at Alamo Drafthouse Lake Highlands), you won’t have a better time this year than at the AT&T Performing Arts Center’s Broadway Karaoke Night.